Rhododendron 'Cilpinense' (Ciliatum x Moupinense) is a semi-dwarf LEPIDOTE (possessing minute scales) hybrid bred at Aberconwy in 1927. 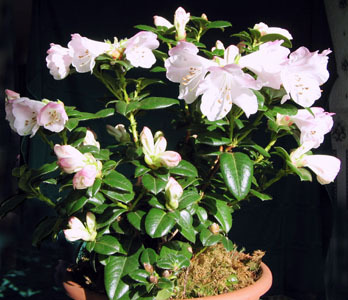 It is a very popular rhododendron with enthusiasts because of its early flowering period - February to March. It produces large pale pink flowers, but it is very beautiful even in bud. It has a neat spreading habit with attractive foliage. 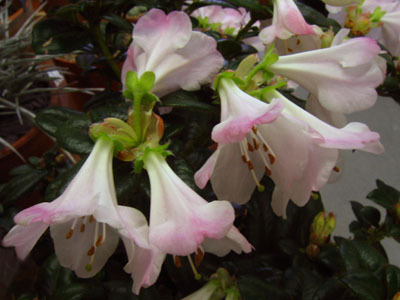 Rhododendron 'Cilpinense' is not for cold areas or frost pockets. Opening buds and flowers require frost protection. It is a good idea to grow it outdoors in a pan or pot and bring it indoors for the period of flowering.